Ever 'lost' embedded devices after a firmware update or an IP address misconfiguration? Not knowing which of the 67 crawl space mount boxes you have to open to find tem? 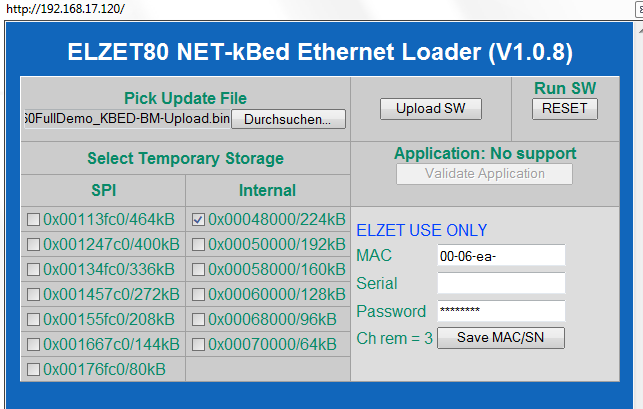 ELZET80's Network Device Discovery tool will find them for you and even re-flash them or set them to a new IP address. Retrieve the IP address of any Ethernet device in your subnet that answers a ping request. 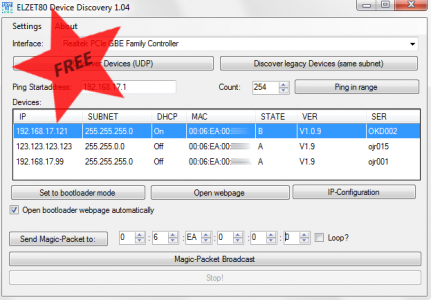 Find misconfigured devices not visible in your subnet. Retrieve IP, MAC, serial number and software version from all devices in the same physical LAN. The ELZET80 Network Device Discovery comes free of charge and is available for download after you register with an email address. To do so, visit the "Downloads" tab at this page. The tool was created for discovery and remote administration of our devices in cases in which the device is not directly accessible (e.g. mounted on the ceiling). If you have a large number of those devices a simple firmware update can become a tedious task. µTasker powered devices feature a bootloader mode for firmware upgrade which is normally triggered by a hardware switch. If the switch on the board cannot be accessed, bootloader mode can be entered by sending a "magic packet" over Ethernet to the device. In bootloader mode the device will not start the saved application but present a website where the firmware can be updated. Remote administration and discovery of ELZET80 and µTasker devices is done over UDP so they are reachable even if their ip configuration is wrong (e.g. other subnet, no dhcp). A UDP-request-packet is sent to all physically connected devices and they will respond with a UDP-packet that contains useful information like IP-configuration, software version and serial number. Devices can also be configured using UDP-packets so misconfigurations can be corrected. The application also features discovery of legacy and non ELZET80/µTasker devices so you can use it even if you don't own our hardware. In this mode a ping (ICMP-Echo-Request) is sent to the broadcast address of your subnet and all responses will be shown in the tool. Unlike the UDP response, the ICMP response only contains the MAC, and ip address. For this mode to work your device has to respond to ping requests coming from the broadcast address! NOTE: A MAC-filter can be setup for both discovery modes so you can search for devices of a specific manufacturer. More information can be found in the manual available for download. Since we're using µTasker in many of our projects and have profited from the development being transparent we wanted to give something back and made the device discovery code available to Mark Butcher, the creator of µTasker. He incorporated the code in his latest release (V1.4.2) and will give you the opportunity to use it on any hardware that is supported by the OS and has an ethernet interface. After setting the define and flashing the software your device should be discoverable by the tool. NOTE: The Ethernet bootloader is not part of the uTasker project and is only available in ELZET80s uTasker project. If you don't plan on using ELZET80 hardware you need to implement the loader yourself. Choose the correct Interface and press the „Discover Devices (UDP)“-Button. All found devices will be displayed in the device list. Choose the device you want to set to bootloader mode from the devicelist and press the "Set to bootloader mode"-button. The device will be reset and the program will try to rediscover it. If rediscovery is successful a new browser window should open automatically and present you with the bootloader webpage. Note: When in bootloader mode dhcp is always enabled. First select the file to be uploaded to the microcontroller and optionally change the temporary destination. Upload the software and run it by pressing the "Upload SW"-button. Running the software means another reset, after which the bare minimum loader will collect the uploaded file. You may also integrate the update feature into your application and set a code in RAM to start the boot loader programmatically. The boot loader might get another IP-address from DHCP than the fixed IP address set for the application (it usually is no good idea to assign the application its IP by DHCP if you need to know which unit is in the cellar and which in the hall).